This infinity scarf is composed of luscious braided knitted strips of seed stitch and ribbing resembling the delicious challah egg bread. These three strips are then rejoined and knit together in stripes of stockinette and reverse stockinette stitch. Suitable for a beginner who is open to a construction challenge. 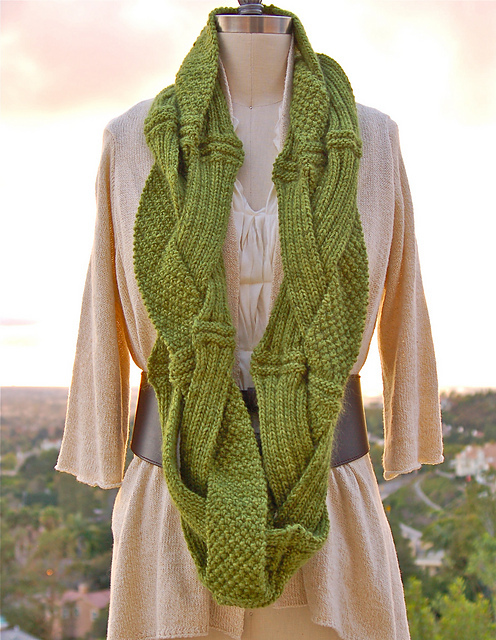 Utilizes only combinations of knit and purl stitches. Ivory scarf is done in Berroco Peruvia and green scarf is done in Shibui Knits Merino Alpaca and Silk Cloud held together in Wasabi.